“Woodcarvings Comploj Albert” is a family business and has been managed for the last 30 years by Olga and Albert Comploj and their sons, Alexander and Andreas. Customers from all over the world bear witness to the excellent quality of our products. The long tradition and experience with woodcarvings are the basis for the creation of unique works of art made from lime or maple wood. 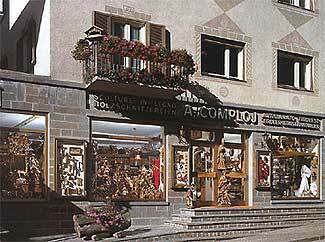 You can find our shop in the centre of Ortisei in Val Gardena. 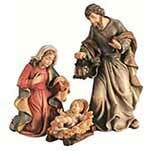 We offer a wide selection of figures and reliefs, both sacred and profane. 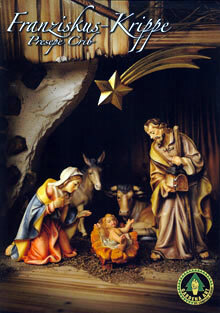 The “Franziskus crib” is one of our own cribs, specially made by Comploj Albert. 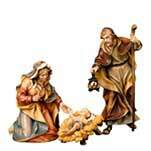 It is carved in maple or lime wood and is available in the following sizes: 9cm-14cm-18cm-52cm-115 cm. The finishes available are natural, multi-stained and glazed. 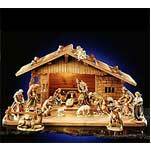 The “Franziskus crib” now has 79 crib figures to choose from, consisting of the main characters (Holy Family, three Kings), shepherds and nativity animals. IIn our recently refurbished shop in the middle of Ortisei’s shopping street, we have prepared one of the largest displays of cribs for more than 40 years. 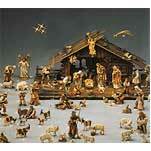 In addition to our own figures, we also sell those of other woodcarving workshops in Val Gardena. 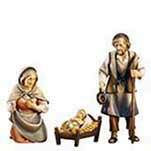 You will also find rare crib figures in our extensive collection. 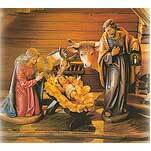 Why not surprise your loved ones with a collector’s crib, a guardian angel or a patron saint! You can also choose from a variety of non-religious wooden figures like clowns, morris dancers, animals (owls, elephants, cats), zodiac signs or flowers.